Obstetrician Ian Donald, one of the pioneers of the clinical ultrasound back in the 1950s, understood the implications of his invention: The ultrasound humanizes the hidden form of the unborn child. Donald rejoiced in how the images forged an emotional connection between a mother and the child within her. The recent Associated Press report on declining abortion rates proves that states with fewer abortion restrictions saw the sharpest decline, while states hostile to women’s health actually saw rates increase. It proved nothing of the kind. For one thing, there were only two states with increases, and those were attributed to out-of-staters whose home states just restricted abortion. For another, pro-life states averaged a nearly 15% drop, which is sharper than the overall decline of 12%. At best, she can point to the fact that “five of the six states with the biggest declines…passed no recent laws to restrict abortion clinics or providers,” but that neither erases the declines in pro-life states nor shows that pro-abortion policy somehow deserves credit for the numbers (some credit contraception for the declines, conveniently forgetting all the evidence to the contrary). Abortion reporting standards vary greatly across states. [MD, NJ, NH, WY, and the populous pro-abortion California don’t compile data at all – CF] Sometimes reported decreases are caused by less rigorous reporting rather than actual declines in the incidence of abortion. Secondly, the AP piece’s analysis would have been better if it had focused on abortion rates rather than the overall number of abortions, since some of the fluctuations in abortion numbers might have been affected by changes in population or demographics. In a 2014 study published in Obstetrics and Gynecology, researchers analyzed 15,575 abortion visits in 2011. All patients received an ultrasound, and all had the opportunity to view the image. Only 42 percent of the women chose to look, yet about 98 percent went on to have an abortion. What she left out: her parent company, Planned Parenthood, sponsored the study. What a surprise that it found the outcome most profitable to them. Consequently, both the study and the reporting on it are more than a little misleading. First, all the ultrasounds were performed in a single Planned Parenthood clinic, and the researchers didn’t directly collect any of the resulting data—PP personnel gave it to them, and they just accepted it without reviewing it themselves. Second, the study claims that 98.4% of women who saw ultrasounds chose abortion and only 1.6% chose life, but the vast majority of those women said going in that they felt “clear and confident” about their decision to abort, while only 7.4% began with “medium” or “low” certainty about their decision. So a more comprehensive breakdown of the exact numbers would show a more substantial pro-life effect among women who are conflicted or open-minded about their decision. Third, consider that women who’ve already scheduled abortions aren’t a perfect analogue to all persuadable women. While it’s just as important they see an ultrasound because any life saved is worth it, the impact is strongest on the undecided—women who are seeking treatment before they’ve made a decision, who’ve seen the images on TV, in print, ads, or social media. Besides, if ultrasounds are so ineffective, then why are they so scared of simply flipping the screen around and showing their patients the images they’re already scanning for anyway? Fourth, many others have found just the opposite—for instance, a 2011 study by Quinnipiac University’s Mark Gius found “ultrasound laws had a very significant and negative effect on the abortion decision,” mobile medical clinic nonprofit ICU mobile says that “56.4 percent of those who have already decided to have an abortion choose life, and 87.8 percent who are considering an abortion choose life,” and a 2002 report from Massachusetts News found significant drops reported from a variety of pregnancy centers across the country. I could see evidence of the growing life inside of me as my body changed with my pregnancy. I did not need legislators to try to force me to confront an image on the ultrasound. Honestly, my imagined vision of my child was way more significant than the grainy image on the ultrasound screen and the kicks I felt were much more real than the heartbeat I heard during the ultrasound. Yet, I still chose to end my pregnancy because I love my own life and I wanted a child who would be able to live a full life and not die during delivery or a few hours after birth. Apparently she thought it was a good idea to go out of her way to draw attention to the fact that she knows that what her business destroys is a “growing life” and a “child.” Seriously, how is it that so many people who defend abortion professionally keep falling into this trap? Not to mention the obligatory default to a wanted baby aborted for some severe medical complication—i.e., a case hand-picked to be less affected by an ultrasound than the average abortion on every level. So yes, America, ultrasounds are most certainly a factor in declining abortions. 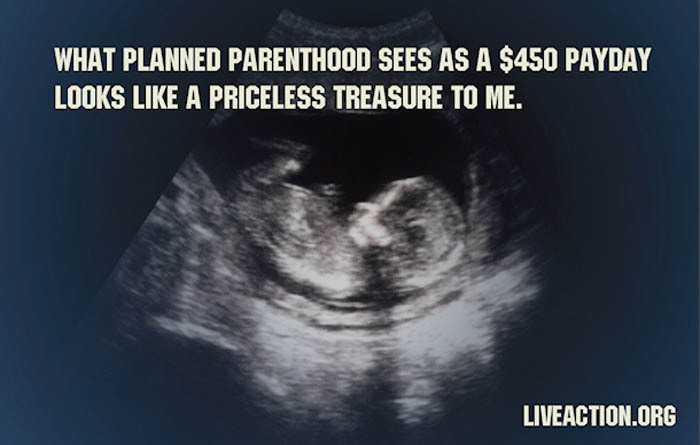 Truth, however, remains a non-factor at Planned Parenthood.